APU continues to be a life-changing experience for Don & Rosie Bowers. The couple met on campus when APU was still known as Azusa College. Don accepted the Lord as his Savior shortly after arriving as a student. The couple went on to graduate, and even celebrated their 50th wedding anniversary on the campus. Rosie, whose three sisters and several cousins also attended APU, grew up in a loving Christian home. At the tender age of 12, she accepted the Lord and claimed the verse from Philippians 1:9-10: "And this is my prayer: that your love may abound more and more in knowledge and depth of insight, so that you may be able to discern what is best and may be pure and blameless until the day of Christ." To this day, it remains one of her favorite scripture passages. Don was called to the ministry. Throughout Southern California, he served as a pastor at several churches, as well as on APU's staff as director of church relations/alumni liaison and in the Office of Estate Planning. He later served as an associate pastor at the Cucamonga Christian Fellowship Church and chaplain at APU's Murrieta Regional Center. Rosie taught in public and Christian schools, and always had her own leadership ministries-directing women's groups, leading Bible study classes, and teaching-in the churches the Bowers family attended. An avid reader who loves to write, Rosie took a break from teaching to raise their four children, who have added 10 precious grandchildren to the family. Don likes to share the unique experience of having been mentored and ordained into ministry by Cornelius P. Haggard, the longest-serving president in APU's history. Later, the grandson and great grandchildren of Haggard attended the church where Don served. Don strongly believes that the legacy of leaders like Haggard continues to impact his own grandchildren and great grandchildren and the church of Jesus Christ. Don is a living testimony to his own favorite scripture verse found in Romans 12:1-2. "Therefore, I urge you brothers, in view of God's mercy, to offer your bodies as living sacrifices, holy and pleasing to God; this is your spiritual act of worship. Do not conform any longer to the pattern of this world, but be transformed by the renewing of your mind. Then you will be able to test and approve what God's will is-His good, pleasing and perfect will." Don & Rosie remain very involved in APU activities on campus. They continue their long-lasting friendships from their days as APU students, and have students from their church attending the university. They are especially proud of their granddaughter, Jacklin Elliott, who enrolled in APU's pre-nursing program. The couple also feels richly rewarded with their charitable annuity investment in APU. "In giving a charitable annuity, we will receive quarterly payments for the rest of our lives. The interest rates are fixed and not impacted by the economy, and our gift annuity saves us tax dollars," they explained. "It's a win-win situation for us, and most importantly, for the kingdom of God." The couple also gives annually to APU. "We give because young people's lives are still being transformed at APU. They are making an impact on our culture as they spread the gospel around the world." The Bowers remain in awe of the dramatic growth of APU's students, buildings, and programs, and the university's unwavering commitment to its God First motto. 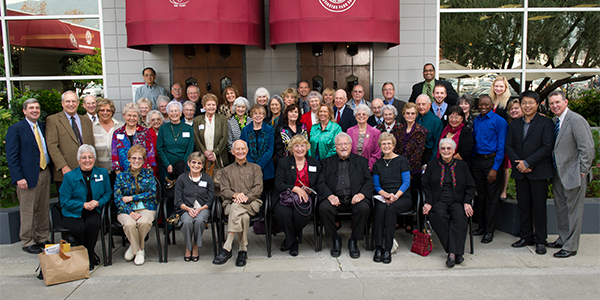 They believe APU truly exemplifies academic excellence in a Christian environment that changes lives. They are living proof of it.